There are two types of colleges in France; there are grand écoles and universités. The universités are public and very affordable. I’ve heard that it costs a 1000 Euros ($1300 to $1400 depending on exchange rates) or less to attend a université for a whole year. The grand école students look down upon the université students because they feel that their more expensive school is better. I think there is some merit to this because the grand écoles are ranked higher than the universités. As one would expect, a better school comes with a bigger price tag. I’m not sure if the pricing is similar for all grand écoles, but Bordeaux École de Management, a.k.a. BEM, is a private school and the students pay 8000 Euros ($10400 to $11200) per year. The structure of schooling at BeM is quite different from anything in the U.S. and I hear it’s even different from other schools in France. This structure might be changing due to the merger of BEM with another private school. The current structure goes as follows. The school year is divided into ten sequences, four from September to December and six from January to June. Each sequence lasts three weeks and you can only take one class per sequence. For an exchange student this setup is ideal, but I don’t think I would like it for U of L. In the three week sequence you have 45 hours of class time, but it is not split evenly between the weeks or days. It is purely up to your professors to decide how the class will be divided. I say professors because you typically have more than one for each class; it tends to be split between three professors. You could have 27 hours one week, 12 hours the next week, and only 6 hours the last week; with the final exam usually on the Friday of the third week. Now there are positives and negatives to this set up. On the negative side you can have 6 hours of class a day for four out of five days on those heavy weeks. On the positive side, when they load up the hours in one week you usually get several days off on the next week. There have been times where I would have off from Wednesday of the second week to Tuesday of the third week. Another great thing about having the sequence set up is that with only 10 possible sequences there tends to be many one week breaks throughout the school year, especially during the spring. I was there for four sequences from January to April and in that four month period I had four one week breaks. If you decide to go to BEM, I hope that they will have fixed the one issue that seemed to bother all exchange students, their wifi or lack thereof. They do have free wifi for all students to use, but the problem is that it doesn’t work very well. It seems that their wireless routers cannot handle heavy traffic, because it seems to work fine in areas where there are many students on computers. For the most part, I stopped carry my laptop to school because the wifi never seemed to work. One professor even said once “if you have wifi you should try to download the document I posted.” It’s funny that even the faculty knows the wifi is bad. I’ve also had professors try to pull up web pages during class and not be able to. The worst is when a professor assigns a group presentation early in the day before lunch and you have to work on it during the day to be presented later in the same day, and you have trouble researching the material needed to do the presentation. All in all I really enjoyed BEM and the wifi is the only complaint that I have. I would definitely recommend going there for your study abroad experience. 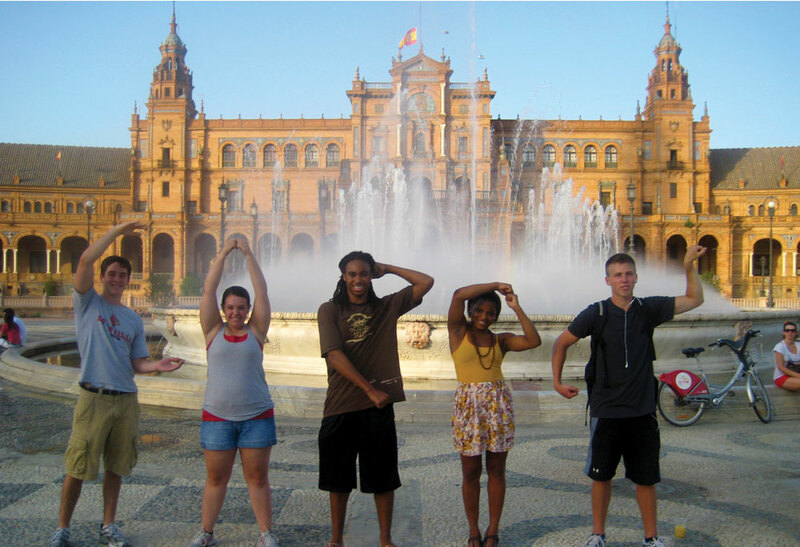 This entry was posted in Study Abroad by Jason Zuckero. Bookmark the permalink.